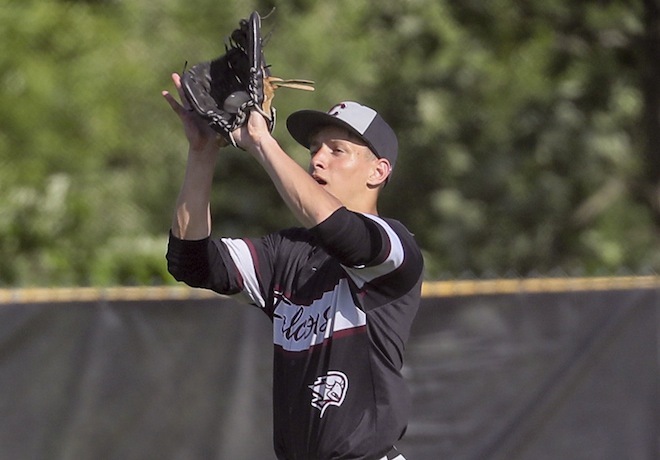 A year ago, the Westosha Central High School baseball team was two wins away from reaching the WIAA Division 1 state championship series in Appleton, dropping a 4-3 decision to Kenosha Tremper. The Falcons, however, return 10 letter-winners, including all of their pitchers, which gives six-year coach Jacob Morman plenty of reasons for optimism. Westosha Central, which finished 17-7 overall and 8-6 in a competitive Southern Lakes Conference, bring back seniors Austin Glidden, Alex Salerno, Dylan Anderson and junior Cooper Griffiths. Salerno, a second team all-conference last season, batted .333 with 25 runs scored, 13 RBIs, two doubles, three triples along with a team-leading 13 stolen bases. Salerno, an outfielder, also contributed on the mound where he allowed four earned runs through 11 innings for a 2.55 ERA. For Glidden, he had a .321 batting average, scored 21 runs, collected eight doubles and hit a team-leading two home runs en route to second team all-conference honors. On the mound, where Glidden logged 29 1/3 innings, he fanned 28 hitters and accounted for a 2.86 ERA. Offering the two all-conference performers support on the mound will be Anderson, the team-leader with 47 1/3 innings pitched, along with Griffiths and his 37 innings. Through 47 1/3 innings, Anderson showed command, striking out 22 hitters compared to nine walks and finished 4-1 with a 1.92 ERA. As a hitter, Anderson collected four doubles, a triple and home run. Griffiths, meanwhile, struck out 44 and issued 19 walks in 37 innings to conclude his sophomore season with a 5-3 record and 2.27 ERA. Junior Bryce Kerkman, another returning letter-winner, went 2-0 along with a 1.89 ERA through 29 2/3 innings last year. Additionally, the Falcons welcome back junior Andrew Hrncar, who won two games on walk-off hits last season. Hrncar, an outfielder, collected 20 hits and knocked in a team-leading 23 runs for the Falcons. Other returners are senior outfielder Samy Greco, sophomore pitcher/outfielder Kyle Mitchell and junior catcher Myles Kazumura. Mitchell, as a freshman, guided the Falcons to victory against visiting Wilmot with a game-winning bases loaded hit in extra innings last season. The Falcons will need to replace graduated seniors Josh Leslie, who was named honorable mention all conference in 2019, along with Sam LeFebve. Leslie, who played shortstop, finished his final Falcons season with .315 batting average, nine stolen bases, five doubles and two triples. Offsetting the losses of Leslie and LeFebvre are six newcomers who have shown potential in early season practices. Joining the mix are senior outfielder Adam Simmons, junior infielder Tyler Horton, junior infielder/catcher Kyle Kitterman, sophomore pitcher/infielder Matt Felske, freshman pitcher/infielder Jack Rose and freshman utility player Michael Mulhollon. Thanks to a six-run bottom of the second inning, Westosha Central opened its season with an 11-5 victory of visiting non conference opponent Racine Case on March 27. Contributing for the Falcons were Kazumura (1-3, two runs, double, RBI), Mitchell (2-3, two runs, RBI), Glidden (2-3, run, double, two RBIs), Salerno (1-4, two runs, three RBIs, double), Griffiths (2-3, two RBIs) and Anderson (2-2, two RBIs). Anderson struck out four, walked two and allowed four earned runs on five hits through four innings to pick up the win. Host Indian Trail scored seven runs in the bottom of the second inning to defeat Westosha Central 11-1 on March 29. The Falcons, who dropped to 1-1 overall, garnered their lone hit from Salerno.